When you set out on an adventure, there are some prerequisite elements: villainy, heroism, travel, anticipation of the unknown and a sense of wonder. My visit to Vicarious Visions this week was definitely an adventure, though there wasn’t a whole lot of villainy. I think the biggest part was the unknown – with a 9-year-old son at home, his mom and I have worked to keep him as far away from the Skylanders franchise and this has kept me from it as well. My visit to Vicarious Visions studios proper in Albany, NY began at around 11am, where approximately 30 journalists from around the world were brought into the hub of their offices: a central kitchen area that was used for everything from meetings and cooking to movie nights and perhaps even a battle or two of plastic bow-and-arrows. As we all sat down to face a screen, we were introduced to the founders of VV, brothers Karthik and Guha Bala . My worst fears realized, I was a thousand miles from home, watching a powerpoint presentation… and then it happened – these two guys managed to share their personal passion for games. Starting with their history of more than two decades of game making, from indie studio to risky bank loans to the Activision acquisition, the presentation really showcased what Vicarious Visions is – a scrappy developer who could. The stable of games they’ve made aren’t all hits or studio-defining mega hits that have shaken the world. Instead, they’ve done what so many other developers have failed to do: grow, and learn and ultimately survive. Wait, what does this have to do with Skylanders: SWAP Force? Yeah, yeah, I’m getting to that. [singlepic id=16268 w=320 h=240 float=left]The games they’ve made have all led them to this point – and while some titles have been there to pay the bills, games like Tony Hawk Pro Skater 2 (GBA), Marvel Ultimate Alliance, Guitar Hero DS, and Doom 3 (Xbox) have shone and all pushed them to grow and learn – and those skills are showing themselves in the third installment of Skylanders. I could write about the creative layout of their studios or their strong sense of teamwork, or that rather than segmenting their departments they put people together from different walks to challenge each other and shorten lines of communication, or the dedicated play-testing with kids, but all of that takes a back seat to the result. SWAP Force is, for lack of a better word, fun. It’s not targeted at adults, but that’s what makes it such a skilled balancing act. Adult gaming is generally a fixed target – you generally don’t have to discern between the late-teens and the mid-thirties gamer. Cool is cool – but when it comes to being accessible enough for a 6-year-old child while having enough depth for the older kids, that’s where you end up developing a single game for different audiences. If the game seems complex, then you’ve just alienated your younger audience, but without legs you’ll lose your older market. On top of that,the third and key party, parents, have to be satisfied too. An example is that while guns and cannons exist in the game, you won’t find a single bullet – instead you have bubbles with piranhas, or snowballs and the like. So how did we get to SWAP Force? Activision tapped Vicarious Visions several years ago, indicating they’d be making the third game. They were tasked with coming up with a compelling sequel (in fact, they were still working on the 3DS version of Skylanders when SWAP Force development began), and it had to fit the existing mythos but bring a fresh take on the franchise. At that time, Skylanders was a huge risk for Activision, and while Toys For Bob pulled it off, the initial release was polarized in its potential: it could fail miserably with an entire line of toys sitting on store shelves collecting dust, or it could become a genre-defining game (which arguably it did). [singlepic id=16273 w=320 h=240 float=right]Per the six presentations from key areas of development, Vicarious staff walked us through their challenges and victories: from trials and tribulations of how they came to the mix-and-match of body parts to the technology, gameplay elements and the eventual design of each character. For instance, one evening was described where the “Aha!” moment occurred. Kevin Dobler, Lead Artist, decided to take home existing Skylanders and sit at home with an exacto knife, some glue and a cell phone to make a Frankenskylander. This moment, and a video sent after-hours to key team members brought about the decision to go multi-part. Initially the team worked on where to split the characters, what kinds of properties to use, and texture blending – when the decision to use costume breaks and two parts was decided, the real work began. And this the kind of information each team member brought forward – examples of that kind of progress, as we were ushered, room by room, through the different realms of game (and toy) creation. From combat mechanics, to character design, to toy and tech prototyping and manufacturing, to the audio and voice-over, storyboarding and animation there was one thing consistent – everyone had a tangible passion for this game. There is no one team that worked in a vacuum, however the combat played a huge part of how the final characters came to be. One example is Fry-no, a fire-based rampaging Rhino with steel fists and a flaming motorcycle. Initially he had steel fists that would detach on chains, but it was found to not play well. In fact, Vicarious Visions has a couple rooms set up dedicated to just that: having kids come in and see how they play with both the toys and the game. [singlepic id=16271 w=320 h=240 float=right]The moves of each of the 16 SWAP Force characters, 16 all-new Skylanders, 16 Series3 returning Skylanders and 8 LightCore characters are fairly consistent. You have two standard attack buttons that are, in the case of SWAP warriors, associated with the upper torso part. There is also a move-based attack, which is associated with the bottom half of a SWAP character. Each of these three attack types have upgrade paths which you upgrade just as you would any Skylander. They’ve also added upgrade pods to allow you to upgrade from within the game itself (as opposed to doing it from the main game menu). Beyond just single elements, there are dual-element portals that require you to either play cooperatively, or have both elements represented in your character to unlock . The combat itself plays otherwise just like Giants or Spyro’s Adventure – fight through a story-driven level while breaking everything in sight and collecting gold and upgrades. There are also mini-games and a horde mode, where you face wave after wave of monsters by yourself or with a friend. For those of you curious about your old collection of Skylanders, yes, they work on the new game and will retain all previously collected upgrades and resources. They are almost entirely identical with several exceptions. First, the visual and audio presentation has been polished to match the feel of SWAP Force and are even prettier on the next-gen systems. The level cap has been raised to 20, and all characters can now jump. I’m going to throw a whole bunch of tech terms at you, but I’ll tell you what that means to Skylanders. First up is dynamic lighting – a natural transition of light and mood as you travel through the Skylands. You can feel transitions as you pass through an elemental portal which shifts the lighting appropriately, or time passing from day to night. Ambient occlusion gives SWAP Force an animated feature film-like quality, and motion blur keeps the animation from feeling choppy. The one discernible difference between current and next-gen versions is the parallax textures – a flat surface looks three-dimensional without requiring heavy polygon counts, and on the demo version we played on a PS4 dev kit (there was only one available – the rest of their next-gen dev kits including Xbox One and PS4 were in use by the developers at the time). Not that the current generation looks shabby, but the detail on the PS4 (and we’re told identically on the Xbox One) is so rich that it’s noticeable. [singlepic id=16270 w=320 h=240 float=left]The audio, on the other hand, was something not as easily described – sure, I can tell you about the more than 80 unique sounds, some real, some synthetic that were collected per character. In fact, a list of the sounds and how they were created would produce a pretty funny list. What truly blew me away though was the detail that they put into the music tracks. They avoided the looping sounds that some games use, and instead employed something called stems. This concept is best explained by looking into Vicarious Visions’ not-too-distant past with Guitar Hero. Consider each instrument path a stem, and in layering them you gain a full song. With SWAP Force it isn’t relegated to simply representing single instruments, but instead allowing the game to transition moods and feelings as you play the game. Simply getting closer to enemies will drum up combat music stems, but blended with character-relevant sound and music stems. Moving around will engage certain stems that bring in percussion. It was beautifully rich and deep, and while in the sound booth we really got to experience its full glory – if you have a full sound system this should prove to be an exciting experience. Unfortunately during our gameplay sessions there wasn’t any audio system to truly enjoy the nuances first-hand. One of the break-out sessions focused on voice acting, cutscenes and animation. In it they shared with us the process by which the cutscenes were built – a process in line with Hollywood production practices. Honestly, the personality of the game is delivered through these scenes, and one of the most compelling pieces we got to experience was an intro video for Fryno – and I can tell you right now that I hope they bring these kinds of scenes forward for more of them. The voices were fantastic. I’m a pretty big fan of Patrick Warburton, so it was nice to see him still involved as Flynn. Toy-making without the elves The last station I ended up at was the toymaking room – a wall of prototypes and experiments covered one wall, while a workshop with a giant 3D printer occupied the other. From slight colour variants to entirely different designs, the craftsmanship in building the toys was second-to-none. While the idea of action figures might appeal, the point of Skylanders portals is them being frozen in our world, and if you’re a fan of collecting toys, these are certainly worth having on the shelf. How do I like it? 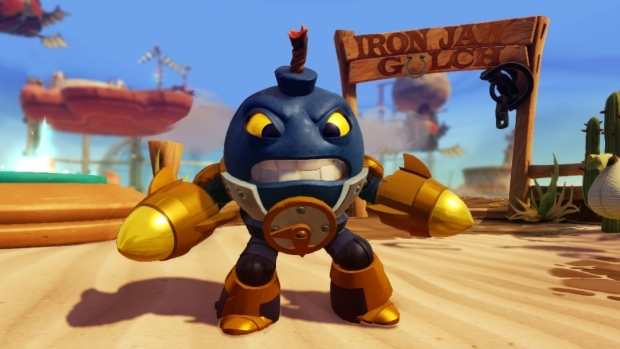 If you’ve played a previous Skylanders game, it is going to be familiar territory. I’ve had a few excursions in the Skylands prior to my visit, and while this version certainly is a compelling kids’ game, I could only see myself entertained while playing cooperatively with my son. Given that tends to be the only time I get to play games without feeling guilty about sitting around, I’ll take it. The next-gen PS4 and Xbox One are by far the best iterations, where the graphical and audio fidelity are at their finest – but current-gen systems including the Wii U are simply scaled down versions of the same game. I should mention that I spent a fair amount of time on the Wii U version, and the touchscreen menus were basically locked out as we didn’t have a full version running. That being said, it looked and played great. I wished I could have had more time backed by a full sound system to truly explore the game – perhaps I might just have to let this one in the house. [singlepic id=16275 w=320 h=240 float=right]It struck me while we were all out to dinner after the presentation and gameplay – the lessons they’d learned, the development steps that got them to where they’ve gotten to today: after SWAP Force hits the market, I look forward to seeing what Vicarious Visions takes from this experience and applies to a game that targets an adult audience. Perhaps new IP, or even something we’ve already played – but with their dedication and passion, I firmly believe they are a more than the sum of their parts and can push compelling game experiences. As it stands, Skylanders: SWAP Force is slated (in the US) for an October 13th launch on all current-gen consoles including PS3, Xbox 360, Wii, Wii U and 3DS. The starter kit retails for 74.99, with additional characters running at 9.99 for the core characters and 14.99 for the SWAP Force figures. As for the next-gen dates? All I got was “launch window” as the release timeframe – stay tuned for further updates as the PS4 and Xbox One release dates get closer.